This bungalow-style house is nestled back among cedars and firs. There are lovely water views from the deck and garden. There is deep peace here. When travelers arrive at the property, it feels like entering another world. The tide comes into the saltwater bay and out again twice each day. The profusion of bird life is delightful. The Herons are regal as they slowly wade in the shallows. Kingfishers and Ospreys fish for their dinners. It is the perfect nature sanctuary to rest and renew both body and spirit. We are Eco-friendly, offering recycled and organic amenities. Sit by the fire or on the deck in the mornings with the organic tea or coffee provided as staples in the kitchen. In the evening, soft organic cotton bedding gives guests a restful nights sleep. We offer handmade soap made locally with natural ingredients. Other bath essentials have natural botanicals and are certified organic. Cleaning products are unscented and natural as well. Although the property seems a world apart, it is close to all amenities... a romantic dinner out, a healing massage, or a movie night are within reach. So quiet and beautiful, yet the ferry and downtown Bremerton are only minutes away. Kayaks and paddle boats may be rented nearby. Local gym facilities with swimming pool and tennis courts are available for a modest day-use fee. The bungalow is a free standing guest house on the property, with it's own entry and private deck. The interior of the cottage features a vintage 1950's style kitchen with art and furnishings that add fun and charm. We offer a discount for stays of one week or longer. An additional discount is offered for 28 days or more. Perfect for getaways, retreats, and business travelers alike. Come and experience all the natural beauty and a slower, more soulful pace. Peace and quiet await you here. As a California girl transplanted to the Pacific Northwest, I was exploring the beautiful Mt. Rainier and met a small town local boy who loved the mountains. A marriage, two daughters and 27 years later, a heartfelt wish came true: to have a property on the water. We still visit the mountains but my husband now has a new passion... kayaking! He is out on the water as soon as the tide is high enough for him to get in.... and then he is back before the tide won't let him return! It is a true exercise in "going with the flow". There is a deep serenity here. It feels unlike any other place we have been. The slow, quiet, rhythmic movement of tides and the immense natural beauty captured our hearts. When travelers arrive at the property, it is as if one has entered another world. It is easy to forget about worries here and feel peace. The tide comes into the bay and out again twice each day. The profusion of bird life is delightful. The Herons are regal as they slowly wade in the shallows. The Kingfishers have a staccato call and dive to catch their suppers. The Osprey perch and wait... then join in, diving for a meal. We have on occasion seen otters. So quiet and beautiful, yet the ferry and downtown Bremerton are just minutes away. Scent free, natural laundry products provided. covered carport for one car... driveway can accommodate one other vehicle. Dining area with windows that look to the water. Nice selection of DVD Movies. Library with assorted fiction (all genres, some local authors) coffee table books, gardening, metaphysics, world travel, biography. Book lover's delight. 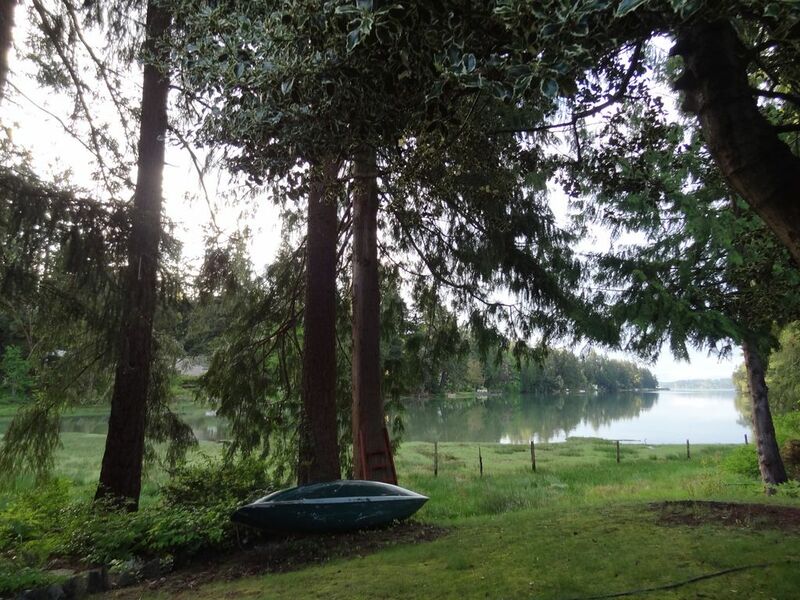 The side yard has Adirondack chairs and a beautiful view of Puget Sound. Guests may bring their own kayaks or rent them locally. Large spacious deck with seating and small table... private with water view. Local athletic club is 5 minutes away. Day use with small fee. We were in Bremerton awaiting the birth of our first grandchild. The bungalow was truly a home away from home. The check-in process went extremely smooth. Vhey was waiting for us when we arrived to show us around the home. A basket of wine and goodies, along with organic soaps were very much appreciated. The home is completely stocked with everything you need. We were able to cook many meals, including a Christmas dinner. The grounds are beautiful, we enjoyed the peaceful view of the bay as well as the private deck and lush landscaping. The attention to detail and cleanliness of this property is first rate. We will definitely be back. Thank you Mark and Vhey for a wonderful experience. Hosts Mark and Vhey are gracious and friendly, but know the value of privacy. We played games, went to Seattle for a concert; hiked in a nature preserve. And relaxed! From this comfortable home we watched the tide roll in and out. I would recommend to others. Dear Karen, so glad to hear that you had a relaxing and comfortable stay. Good to know you enjoyed the selection of games! I wonder what was your favorite? We enjoyed having you in our little Bungalow by the sea. It was nice meeting you both. Come back any time. Lovely house w water views! Photos don't do it justice. Very clean. Was raining while I was there so enjoyed the fireplace, extensive reading library and video collection. They had wi-fi and a 28-in TV if I wanted. The owners were wonderful to work with and left me a welcome gift basket of wine and goodies upon arrival! I'm an organic type person and so enjoyed the organic coffee, tea, soap and sheets as well! The kitchen was well-stocked with everything I needed to prepare meals. Private but not far away from restaurants and stores if I so chose. Loved the sweet ambiance of the bathroom, bedroom, dining and living areas! Thank you Conie. We are delighted you enjoyed your stay and the cozy ambiance. We agree, the water views are one of the nicest things about the property, although sitting by the fire on a rainy night is a close 2nd. Thanks for choosing us. Come back any time!